Symptoms of an asthma attack are wheezing, a cough, tight chest, and trouble breathing. Wheezing is the classic symptom. Wheezing is a high-pitched whistling or purring sound. You can hear it best when your child is breathing out. The diagnosis of asthma requires attacks of wheezing that recur. The diagnosis is rarely made before 1 year of age. Food Allergy (Serious). Asthma attacks caused by food allergy can be life-threatening (anaphylaxis). Examples are nuts or fish. Peak Flow Meter: a peak flow meter measures Peak Flow Rates (PFR). It tells us how well a person can move air out of the lungs. A PFR can be used in children 6 years and older. Over 10% of children have asthma. Your child's asthma can flare up at any time. When you are away from your home, always take your child's medicines with you. The sooner you start treatment, the faster your child will feel better. Your child's quick-relief (rescue) medicine is albuterol or xopenex. Start it at the first sign of any wheezing, shortness of breath or hard coughing. 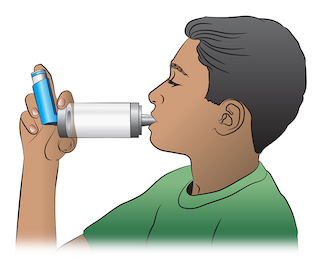 Give by inhaler with a spacer (2 puffs each time) or use a neb machine. Repeat it every 4 hours if your child is having any asthma symptoms. Never give it more often than 4 hours without talking with your child's doctor. Coughing. The best "cough med" for a child with asthma is always the asthma medicine. Caution: Don't use cough suppressants. If over 6 years old, cough drops may help a tickly cough. Caution: If the inhaler hasn't been used in over 7 days, prime it. Test spray it twice into the air before using it for treatment. Also, do this if it is new. Use the medicine until your child has not wheezed or coughed for 48 hours. Spacer. Always use inhalers with a spacer. It will get twice the amount of medicine into the lungs. Your child may have been told to use a controller drug. An example is an inhaled steroid. It's for preventing attacks and must be used daily. During asthma attacks, keep giving this medicine to your child as ordered. For signs of nasal allergies (hay fever), it's okay to give allergy medicine. Reason: Poor control of nasal allergies makes asthma worse. Reason: It will loosen up any phlegm in the lungs. Then it's easier to cough up. Tobacco smoke makes asthma much worse. Shower to remove pollens or other allergens from the body and hair. Avoid known causes of asthma attacks (such as smoke or cats). During attacks, reduce exercise or sports if it makes your child's asthma worse. If treatment is started early, most asthma attacks are quickly brought under control. All wheezing should be gone by 5 days. Step 1. Shake the inhaler well. Then attach it to the spacer (holding chamber). Step 2. Breathe out completely and empty the lungs. Step 3. Close the lips and teeth around the spacer mouthpiece. Step 4. Press down on the inhaler. This will put one puff of the medicine in the spacer. Step 5. Breathe in slowly until the lungs are full. Step 6. Hold a deep breath for 10 seconds. Allow the medicine to work deep in the lungs. If your doctor has ordered 2 or more puffs, wait 1 minute. Then repeat steps 1-6. Step 1. Shake the inhaler well. Step 3. Close the lips and teeth around the inhaler mouthpiece. Step 4. Press down on the inhaler to release a puff. Do this just as your child starts to breathe in. Ask your doctor for a spacer if you don't have one. It will help send more medicine into the lungs. Older children who don't like a spacer can be prescribed an albuterol dry powder device. A nebulizer machine changes a liquid medicine (med) into a fine mist. The fine mist can carry the med deep into the lungs. This is called a nebulizer (neb) treatment. Step 1. Prepare the medicine. First, wash your hands with soap and water. For pre-mixed single dose vials, just add one vial to the neb holding cup. For multi-dose vials, you need to do the mixing. First, add the correct amount of normal saline to the neb cup. Then carefully measure and add the correct amount of medicine to the saline. Step 2. Connect the nebulizer to the air compressor tubing. The air compressor is run by electricity. Portable ones run on a battery. Compressors make the jet of air that turns the medicine into a fine mist. Step 3. Turn on the air compressor. It will start making the fine mist that your child needs. Step 4 for an Older Child. 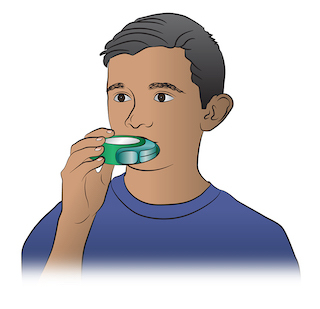 Place the mouthpiece between your child's teeth and seal with the lips. Ask your child to breathe slowly and deeply. Ask your child to hold a deep breath for 10 seconds once a minute. Step 4 for a Younger Child. If your child refuses the mouthpiece, use a face mask. It should cover the nose and mouth. It should fit snugly. Step 5. Continue the treatment until the med is gone. If the med sticks to the side of the cup, shake it a little. An average neb treatment takes 10 minutes. Step 6. After each treatment, take the nebulizer apart. Rinse and clean it as directed. Reason: It can't produce mist if it becomes clogged up. Caution: Closely follow your doctor's instructions. Use the exact amount of med your doctor ordered. Don't give a neb treatment more often than every 4 hours.